SNES Pitfall: The Mayan Adventure (USA) in 11:19.37 by Bablo. Pitfall: The Mayan Adventure is a sequel to an old Atari game and shares a concept similar to its predecessor: Get through the jungle alive and fight something at the end. 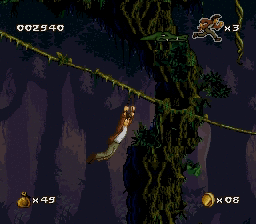 There is also a run of the Genesis version of the game, which has two additional levels. Note: If you decide to watch this run in snes9x, you may notice that the movie's reported CRC does not match that of the (U) ROM of the game. You can ignore this mismatch; the movie plays just fine.